Who is behind that virtual penguin player? This guy. This, everyone, is Trainman1405 (me!) in real life. I’m just an average 18 year old dude who enjoys playing Club Penguin. you are the best trainman. Just like the tenth Doctor. Does your girlfriend know that you own a Club Penguin memories blog? Does your girlfriend play CP? Sometimes yes. Her username is Penny44526. Her name isn’t Penny44526. I’ve tried it in the friend list and it says there is no such penguin. Oops. Penny44546. Sorry about that. If your girlfriend knows that you have a Club Penguin Memories blog, does she ‘comments’ anything about it? What do you mean by comments? She plays Club Penguin sometimes too. Nice penguin cut-out. You look younger than what I thought. Thinknoodles shown his face! Go to his Facecam Vlog Reveal, he did it for Minecon. Wow!What a handsome face are you dude! I cant believe it that you decided to show who you are… I could never ever do that!!! I think you showed as really who is behind the mask. I mean, I can see a 18 yeared old person who just like to be always himself! Am I right? 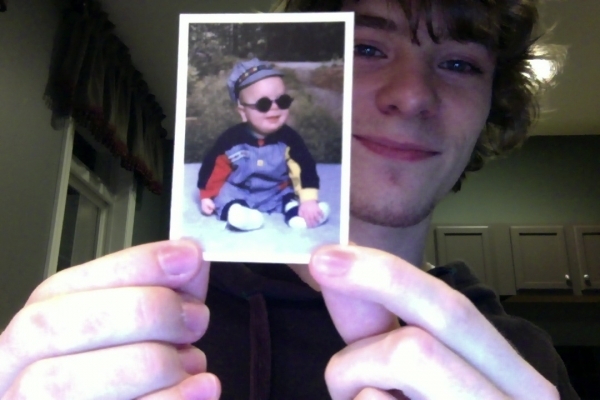 And for the baby Devin, SO CUTE! LOL! How did you made your penguin? Not the things on you, but what you are holding in your hand. I had a screenshot of my playercard, printed it, and cut it out. It was great to finally see your pic. Thanks Boofle! I’m glad you think so. May you stuff your face with cake! I need to send you something but I forgotten the email address.. But don’t get too old on us now. Now knowing your personal twitter account is useless. “Average” 18 year old who likes to play CP? Oh My God! And, happy birthday, Devin! Well I had the impression that I had ever seen before Devin. Her name is Kailey, on CP she’s Penny44546. Wow! I never thought that you would reveal your face before you quit. You aren’t quitting anytime soon right? You look like a strange, skinny, American version of Harry Styles from One Direction. Trust me, it’s a good thing…. You are so cool even now and before! And I like the fact that you are not too shy to show your real face, like me… I am too shy to show off! Ignore what I said before! don’t grow a beard!!! I’d do emails but I’d love to blog for them too! You look AWESOME train. You should get graser to get a pic of him. Anyway, see you at your party!! train do you like photogrphy? Your look looks like your a Club Penguin employee lol. 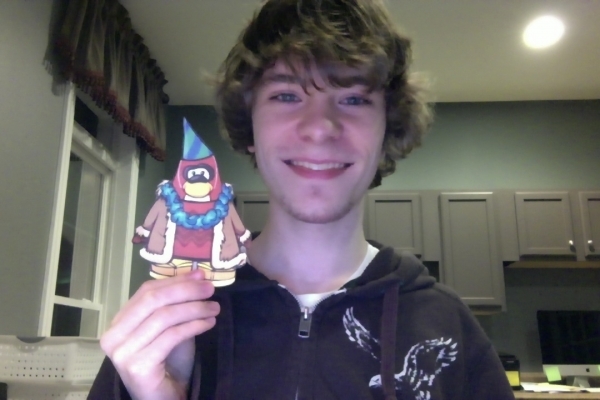 Plus, nice cutout of your penguin, and Club Penguin items! HAPPY BIRTHDAY! Happy birthday devin!!! have a great day! Not bad. I thought you had some other colored hair than golden but it still looks nice. Nice to see you in real life. :O I better watch out! DANG IT, I DIDNT PUT MY PICTUREEE… i keep messing up my email .-. What dress? XD, that would be so funny. I wore a dress and high heels for a play in 5th grade. Hey train I got an update for my penguin is this a bug or something? Train wow It is hard to believe that you will be 18….wow. Where did you get the Club Penguin items from? I got them from the Club Penguin Wiki and printed it out. Happy birthday Devin! 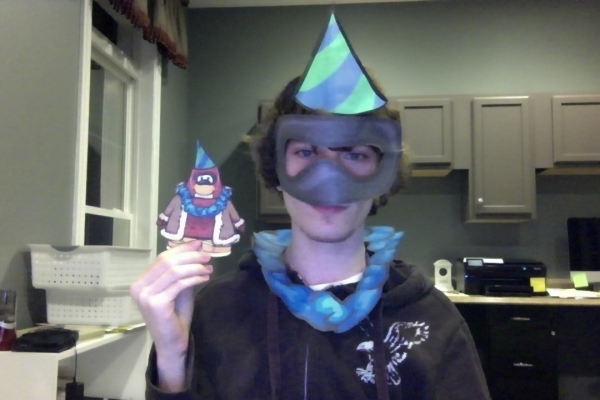 :p you’re a cool guy, and tomorrow your party, can you go to my igloo pls? Help me to win the stamp. You rock Trainman. I think I found James Bond Jr.
You look pretty cool, but maybe you should’ve kept your identity a secret. Happy b-day, btw. train, I said you happy birthday but you didn´t aprobate my comment. I will paste it:Happy birthday Devin! :p you’re a cool guy, and tomorrow your party, can you go to my igloo pls? Help me to win the stamp. You rock Trainman. Quick question: Have you ever seen the universe in a blue phone box. Because you look really similiar to the 10th doctor in my opinion. Haha, no I have not. Wow! You look epic! Prepare a tiny birthday gift from me tomorrow on Twitter (my account is @LittleHobbitBoy). :D Congrats! But still, I am finally glad that we can finally see your epic face! I made the original CP Memories in December 2007. This one I started in October 2010 and released January 2011. I know it will be the 22nd when you see this, but happy birthday! Does your friends family and parents know that you still play cp? what do they think? Yes, they don’t mind at all! Devin, Thank you for 2 years of this AMAZING blog. Now that you are an adult you should enter for a CP job. Next thing we know, we will see your girlfriend’s face! Nice! You look exactly how I pictured you except with brown eyes. How did you just come out with it though? That’s really cool! I wish more bloggers like saraapril would do this. I might..soon..
What do you mean by come out with it? How I thought of it? You’re pretty old for club penguin, but I’m guessing you’re making quite a lot of money off adsense etc, so good luck with your career of being an entrepreneur! Oh, but you are obviously making a little bit… Right? You should benefit from all the hard work and effort you put into making your website look good and having all these people viewing it. Either way I would. But I can see you’re really happy what you’re doing, so good luck in the future. A little bit, yes. Whatever I earn I just keep in my bank account, maybe buying a little something from time to time. Thanks for the kind words! Somehow you remind me of Shaggy, but with a nicer smile and blue eyes. That’s awesome. ur 18 do ur friends know you still play club penguin? Train, you look younger, and, you are so cuuuuuuute! Did anyone recognize you in public after this? No One will ever see me in real life. Mwahaha!